After 13 months of my first and only MacOS-based laptop, the Macbook Air, I replaced it with Windows 8 laptop, the Lenovo IdeaPad Yoga 13. I am still used to Windows software and Windows way of system handling. Mac OS may be more intuitive, but if I’m not familiar, it would take me more time to get things done. Mac OS does not handle Flash content well. When Flash is enabled, the laptop drains battery rather fast. Touch input offers a better and more intuitive experience. Yoga’s design allows me to use as a laptop with proper keyboard and trackpad, and convert to a tablet if needed, plus it can even be made to stand. Thanks to this flexibility, I can angle the screen up to 180-degrees in laptop mode, something that most standard laptops cannot achieve. Well-built. Other hybrid designs appear to require greater care when handling the units. Very fast charge, about 1+ hour to achieve full charge. Good balance of large screen, lightweight and battery duration. Positive experience during my review. I bought it at a good price over online buy-sell forums. 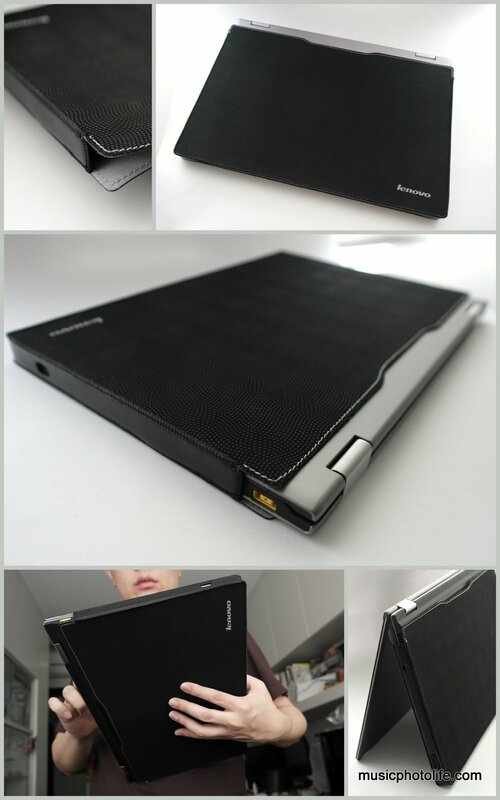 With Lenovo Yoga, there is no need to purchase any tablet stand. Responsive multi-finger gestures to navigate web pages and desktops. The smoothness of the interface, something that other operating system brands could yet match. To clarify, my switch has nothing to do with the “greatness” of one OS over the other. Rather, it’s purely a usage preference. If your purchase does not come with it free, you can buy from Lenovo Exclusive Store by Addon at Funan IT Mall #03-16 for S$69. The case is made of rubberised and leatherised fabric. Its edges are hard while the 2 larger cuts are soft. The case does not cover the Yoga completely, exposing it by an inch so that you can slot only the keyboard section when using as table mode. The shop also sells another beige case that covers the whole laptop. Also available at the above shop, but was out of stock when I went there. Waiting for them to call me when stocks are in. They claimed it will cost S$29. Recommended to stick one because the Yoga glass is fingerprint magnet and highly reflective. This TPU-material is placed on the keyboard to reduce finger wear due to abrasion. I ordered mine on eBay from a Hong Kong distributor for less than US$10. Yoga keyboard – no protector yet. It’s good to get one in case you needed to connect to another display device that uses only the analog connector (e.g. office projectors). This accessory is also available at the Lenovo Exclusive Store mentioned above but selling at $49. I ordered mine from DealExtreme for about US$14. There are many many different similar items with various prices, but I selected the one that is marked as “Staff Pick”.